Just days before the first anniversary of the start of European XFEL user operation, the first results based on research performed at the facility have been published. In the journal Nature Communications, the scientists, headed by Prof. Ilme Schlichting from Max-Planck-Institute for Medical Research in Heidelberg, Germany, together with colleagues from Rutgers State University of New Jersey in the USA, France, DESY and European XFEL, describe their work using the intense X-ray laser beam to determine the 3D structure of several proteins. 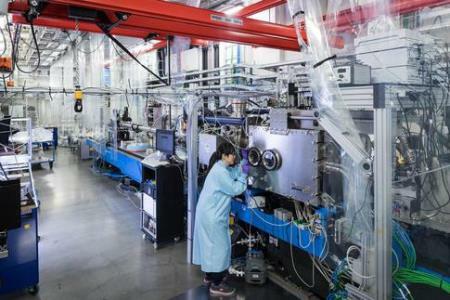 They demonstrate, for the first time that, under the conditions used at the time of the experiment, an increased number of X-ray pulses per second as produced by the European XFEL can be successfully used to determine the structure of biomolecules. As much faster data collection is therefore possible, the time needed for an experiment could be significantly shortened. The detailed determination of the 3D structure of biomolecules is crucial for providing insights into informing the development of novel drugs to treat diseases. The scientists studied a mixture of three plant proteins – an enzyme known as urease, concanavalin A, and concanavalin B. At the SPB/SFX instrument (single particles, clusters and biomolecules /serial femtosecond crystallography), a jet of liquid containing a stream of tiny protein crystals was injected into the interaction chamber. The X-ray beam, consisting of series of ultra-short X-ray pulses, was fired at the jet, hitting the crystals. Where X-ray pulses interacted with the crystals, so-called diffraction patterns were captured by the detector situated behind the interaction chamber. With the help of computer algorithms, these images can be used to construct 3D models of the proteins being studied. The scientists were able to collect many thousands of images which were good enough to be able to distinguish between the three proteins, and construct 3D models of the concanavalin A and B proteins. The X-ray laser can generate up to 27 000 pulses per second. However, the X-ray pulses of the European XFEL X-ray beam are organized into short bursts which are separated by longer pauses with no pulses at all. If a burst lasted an entire second, it would deliver more than a million pulses – or 1.1 megahertz. Now, for the first time ever – such a rate of over one million pulses per second, or one megahertz has been reached. No other X-ray facility worldwide currently can provide such a high rate. Currently only five X-ray lasers world-wide produce X-rays with a short wavelength, so-called hard X-rays. Access for experiments is therefore in high demand, and the facilities are generally highly oversubscribed. Shortened experiment time thanks to an increased number of X-ray pulses as described today will enable more and more complex research projects and allow a larger number of scientists access to the brightest X-ray sources in the world. Acknowledgement: The SFX User Consortium has provided instrumentation and personnel that has enabled this experiment. The SFX User consortium is composed of scientific partners from Germany, Sweden, the United Kingdom, Slovakia, Switzerland, Australia and the United States. The European XFEL in the Hamburg area is a new international research facility of superlatives: 27,000 X-ray flashes per second and a brilliance that is a billion times higher than that of the best conventional X-ray sources open up completely new opportunities for science. Research groups from around the world are be able to map the atomic details of viruses, decipher the molecular composition of cells, take three-dimensional “photos” of the nanoworld, “film” chemical reactions, and study processes such as those occurring deep inside planets. The operation of the facility is entrusted to European XFEL, a non-profit company that cooperates closely with its main shareholder, the research centre DESY, and other organisations worldwide. European XFEL has a workforce of more than 400 employees and started user operation September 2017. With construction and commissioning costs of 1.25 billion euro (at 2005 price levels) and a total length of 3.4 kilometres, the European XFEL is one of the largest and most ambitious European new research facilities to date. At present, 12 countries have signed the European XFEL convention: Denmark, France, Germany, Hungary, Italy, Poland, Russia, Slovakia, Spain, Sweden, Switzerland, and the United Kingdom. For more information, visit www.xfel.eu.